IHT for ex policemen, the armed forces and Motor neurone disease. Under Section 154 of the Inheritance Tax Act 1984, a deceased’s estate may be entirely exempt from IHT if they sustained illness or injury while serving in a war. This exemption can apply to those who previously served in the armed forces or were current serving members at the time of their death. It may also be available to those who were not combatants but were involved during armed conflicts (such as doctors, nurses or war correspondents). To the delight of IFAs in Northern Ireland, it was extended in 2014 to cover members of the emergency services, such as the police, fire brigade and search and even coast guards. It also covers humanitarian aid workers who may be working for government or international organisation. Although the death has to occur as a result of an injury sustained whilst responding to an emergency, this can be a difficult thing to define. There is a six year time limit on applying for the exemption where the IHT may already have been paid in full. How does this relate to MND? 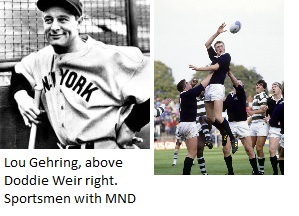 This is the disease that Doddie Weir, (photo above) the former Scotland rugby international is dying from. It is without pain, but slowly disables the body via the nervous system, until, in complete paralysis the brain and heart give out at last. In the USA it is called Lou Gehring, after the famous baseball player who died from the disease at the height of his career. And it is the US link that takes us back to IHT. The US military pay out full widows pensions to all Motor Neurone suffers who served in the forces, regardless of the cause. Although links to the military are not proven, the US taxpayer nonetheless pays out in all these cases. So if you have a IHT client who died with MND in the last six years, and they served, in either the military or the police, then check the IHT rules – you may well be able to put forward an argument that tax should not be levied on their estate. Can the exemption be transferred to a spouse or dependent? Unfortunately, the exemption is not automatically transferred to grant a total exemption on the estate of a spouse or dependent. However, the granting of such an exemption allows the deceased's full nil rate band to be transferred to their spouse's estate.